This special recipe has generous amount of venison and properly processed potato that have excellent nutritional values and very high digestibility. 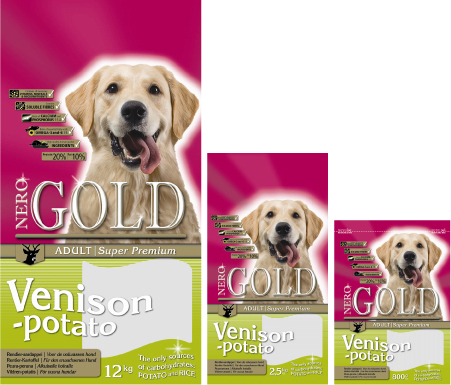 Light and tasty meal with sources of chondrooitin and glucosamin is also great for senior or slightly overweight dogs. Ingredients: dehydrated venison (min. 24 %), rice, potato meal (min. 20 %), egg powder, beet pulp, flax seed, chicken fat, hydrolyzed chicken liver, minerals & vitamins, yeast, sunflower oil, chondroitine, glucosamine, L-carnitine, lecithin, inuline (FOS), taurine. Analysis: protein 20,0 %, fat 10,0 %, fibre 2,5 %, ash 7,5 %, moisture 9,0 %, phosphor 0,9 %, calcium 1,2 %. Added: Vitamin-A (E672) 15000 IU/kg, vitamin-D3 (E671) 1500 IU/kg, vitamin-E (as all-rac alpha tocopheryl acetate) 200 mg/kg, vitamin-C (as l-ascorbic acid phosphate) 70 mg/kg, E1 50 mg/kg, E2 1,5 mg/kg, E4 5 mg/kg, E5 35 mg/kg, E6 65 mg/kg.